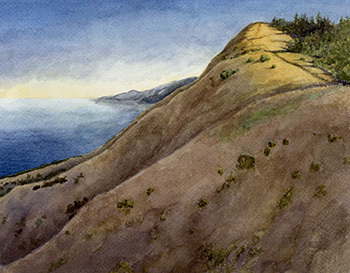 "Reserves of Inspiration: Exploring UC Santa Cruz Natural Landscapes" will run from November 6 to December 8, 2018, at the Eloise Pickard Smith Gallery in Cowell College. 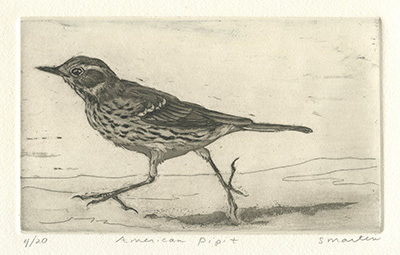 Featured artists include UCSC alumnae Jenny Keller, Stephanie Martin, and Erika Perloff, whose works will be exhibited alongside those of other local professionals and student artists. Hosted by the Norris Center for Natural Historyand the UC Santa Cruz Natural Reserves, the exhibit showcases the natural reserves as a resource for experiential learning and highlights the value of art as a way of exploring and learning about the natural world, said reserves director Gage Dayton. "It's an opportunity to show what the natural reserves provide through an artistic lens. We're not just about scientific research," Dayton said. UC Santa Cruz manages the UCSC Campus Natural Reserve and four reserves that are part of the larger UC Natural Reserve System—Younger Lagoon Natural Reserve, Fort Ord Natural Reserve, Año Nuevo Natural Reserve, and Landels-Hill Big Creek Reserve. The wide range of habitats, from fog-enshrouded redwood forest to maritime chaparral, provide an unparalleled natural laboratory and serve as study sites for university scientists and students. All three of the featured artists first visited the reserves as students in the Natural History Field Quarter course in the 1980s. "We weren't all in the same year, but we knew each other and we all had major interests in art, science, and education," said Stephanie Martin, who earned her teaching credential at UCSC and taught in local schools for 24 years before returning to art as a second career about 12 years ago. "I was so excited to be invited to take part in this exhibit and to spend time in the reserves as an artist. It's nice because our art complements each other. We work in different mediums, so it's interesting to see our different interpretations of the same places," Martin said. In addition to the featured artists, the organizers of the exhibit held an open solicitation and selected 26 art works by students, alumni, and community members who have used the reserves for their work. Chris Lay, director of the Norris Center for Natural History, said the exhibit represents the growth and depth of collaboration between the center and the natural reserves, which have overlapping interests. "Our shared goals include getting every student out in a reserve through some class or activity during their time here, supporting more art activities at the reserves, and better documenting the biodiversity of the reserves," Lay said. "Getting more people out observing, drawing, and making field guides for the reserves will help us keep track of what's there and how it's changing over time." The natural reserves are used by a wide range of UCSC art classes, from drawing and photography to sculpture and environmental art, as well as by courses in science illustration and natural history illustration. Brett Bell, who has four paintings in the exhibit, discovered the reserves as an undergraduate at UC Santa Cruz, visiting Big Creek with classes and exploring the campus reserve and other open spaces on and around the campus. 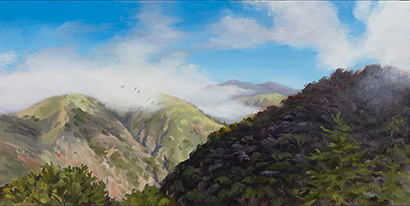 "Without access to spaces like that, I don't think I would be as connected to nature or have the observational skills that help me as an artist," Bell said. After earning his B.A. in environmental studies and biology in 2012 and working in outdoor youth education programs for a few years, Bell enrolled in the Science Illustration Certificate program at CSU Monterey Bay in 2017 and has been working on art projects with Fort Ord Natural Reserve manager Joe Miller. "Having natural environments with relatively little disturbance is important, especially for generations that grow up with less exposure to that. Its value keeps getting higher, whether it's for artistic inspiration, research, or just therapy," he said. Martin noted that, while larger reserves such as Big Creek understandably get most of the glory for their size, grandeur, and diversity of landscape and habitat, the smaller ones such as Fort Ord are also extremely important. "Fort Ord not only preserves a rare habitat, its proximity to the city of Seaside makes it accessible to local schoolchildren for outdoor education programs. It’s small but mighty, and vital for inspiring the next generation of naturalists and scientists." The Smith Gallery is open Tuesday through Saturday from noon to 5 p.m. Two special open house events are scheduled for this exhibit, on Saturday, November 10 (12 to 5 p.m.), and Friday, December 7 (5 to 8 p.m.), when the gallery will have additional staff and activities for the public. Much of the artwork will be available for purchase.